It’s been 25 years since the Armenian EyeCare Project was founded — and we can’t wait to celebrate the milestone with our loyal friends and supporters. Since the AECP’s inception in 1992, we have followed through with our vision for Armenia — a country where no individual is without access to quality eye care; where Armenian ophthalmologists are trained to diagnose and treat eye disease at the highest level; and where preventable blindness is eliminated through an emphasis on prevention and early intervention. We have much to celebrate: the realization of an extremely important and life-transforming mission; a nucleus of exceptional physicians and staff led by a dedicated founder; a 25-year history of unparalleled experience and accomplishments; a comprehensive program meeting a range of needs; hundreds of thousands of individuals who have benefitted from our many programs; and last but not least, our loyal and dedicated donors who make it all happen! With the generous support of friends and supporters like you, the Project has made significant advancements in the delivery of eye care in Armenia. Through the help of donors and so many others, we have been able to do some amazing things over the past 25 years — changing the landscape of eye care in Armenia forever. In 25 years’ time, we have seen hundreds of thousands of patients in Armenia and have restored the sight of nearly 20,000 Armenians who would otherwise be blind; delivered a state-of-the-art Mobile Eye Hospital to Armenia, which brought eye care to those living in the country’s many towns and villages; reduced infant blindness in Armenia by 90 percent, saving hundreds of Armenian babies from blindness, through our cutting-edge ROP Program and Center of Excellence for the Prevention of Childhood Blindness; established a medical education and training center with libraries, classrooms and a wet lab donated by Pfizer; trained hundreds of doctors and ancillary medical personnel in the art and science of ophthalmology; sponsored eight fellowships for Armenian ophthalmologists at the finest medical institutions in America, each fellow later returning to Armenia to train their colleagues and direct clinics in their sub-specialty; and handed out more than 70,000 prescription eyeglasses to Armenians in need at no charge. As much as we’ve accomplished in 25 years, there’s still so much to do to ensure quality eye care is truly accessible to every Armenian in need. Currently, we are working on our most ambitious project yet — Five-for-Five — developing five Regional Eye Clinics throughout Armenia in five years for $5 million. Initiated in 2014, we’ve already completed two Regional Eye Clinics — the Haig Boyadjian Regional Eye Clinic in Ijevan, Tavush and the John and Hasmik Mgrdichian Regional Eye Clinic in Spitak, Lori — and have three more to go. Working with the Ministry of Health and local governments, we will be developing these local clinics in the regions of Armenia where they’re needed most and where they can reach the highest number of Armenian residents. 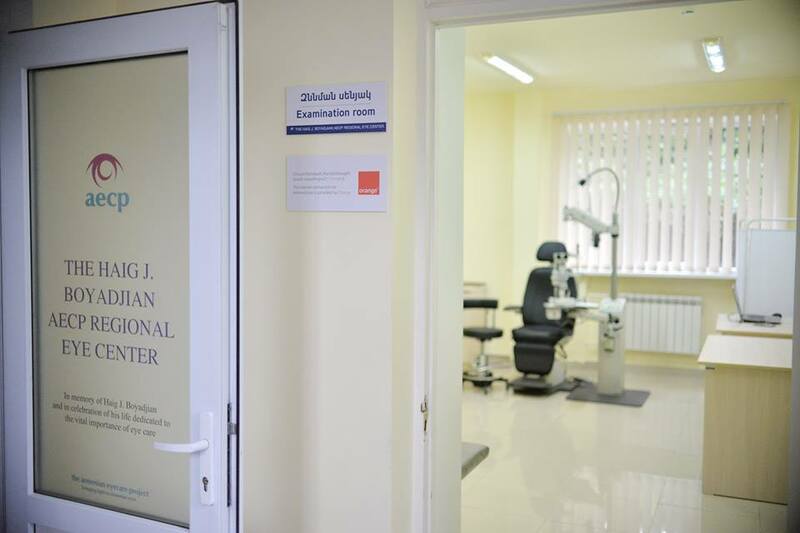 Located in Ijevan, Tavush; Spitak, Lori; Kapan, Syunik; Gyumri, Shirak; and Yeghegnadzor, Vayots Dzor, these five Regional Eye Clinics will provide access to eye care for the two million Armenians who live outside of the country’s capital and ensure that all Armenians have access to eye care all of the time. To celebrate 25 years of rich history and several accomplishments — and to look on to the road ahead — we are planning several commemorative events between now and the end of 2017. Activities will include a handful of parties hosted by friends of the Armenian EyeCare Project; donor trips to Armenia to showcase what we’ve done and continue to do in the country; and a big Gala celebration in November 2017 to culminate our 25th anniversary year. If you are interested in attending one or all of these events, please contact us. Celebrate our special 25th Anniversary with us by joining in on the festivities — and help bring sight to Armenian eyes by contributing today!